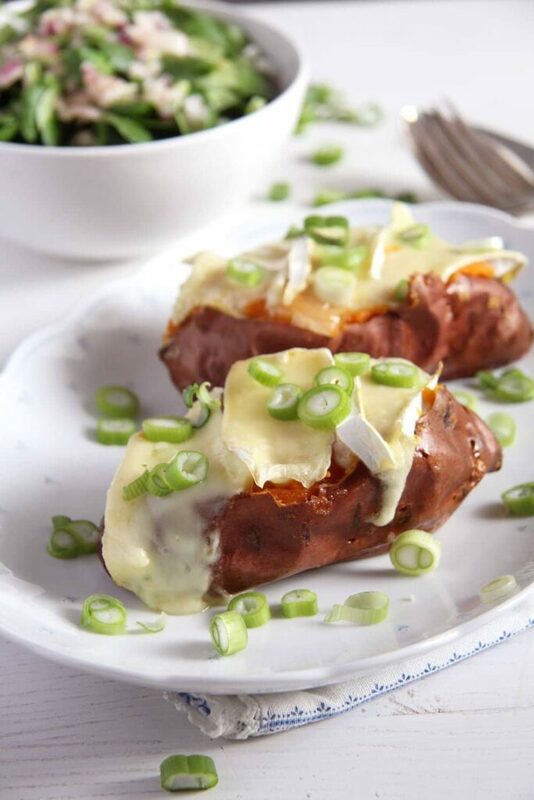 My last post in this Green Onions series brings you soft, velvety, baked sweet potatoes topped with Camembert and green onions. I like sweet potatoes a lot and if I had my own way I would eat them at least once a week, unfortunately I cannot convince my kids to eat them as well. I mean, they try it every time, because one of our rules is that everything that comes on the table has to be at least tried, but they never like them, unless they are really well hidden in some casserole dish, pureed soup, vegetarian meatballs or something like this. I really don’t get it, I mean sweet potatoes are sweet and they like sweet stuff more than anything in the world, so why don’t they like sweet potatoes? Beats me! But I hope this won’t put you off these baked sweet potatoes because that would be a shame. They are so nice and soft and creamy and I just love that melting cheese on top and the crunch and freshness that the green onions bring. 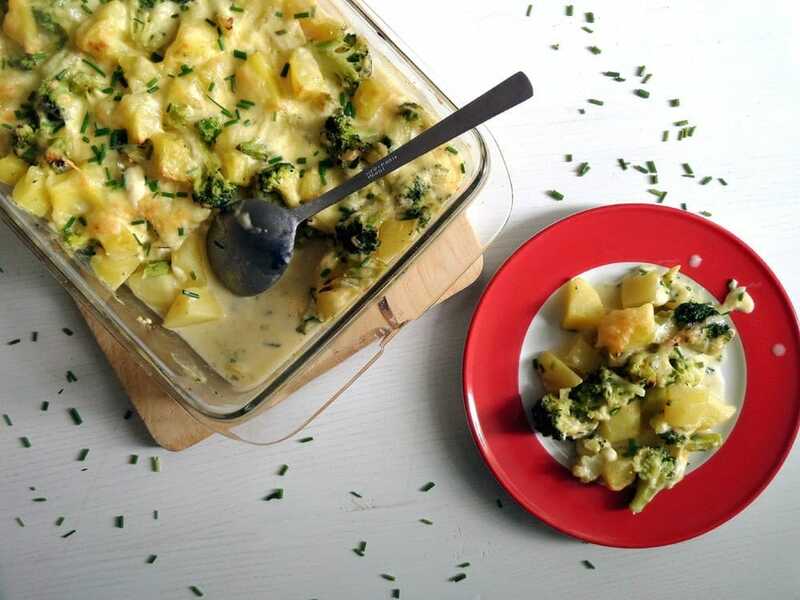 If you don’t care about the potatoes having to be baked for about 45 minutes, than this is also a dish that won’t give you a lot to do either. Just clean and prick the potatoes, slice the cheese and the green onions and you’re done. Everything else takes place in the oven. One quick green salad and you have a delicious and healthy meal in front of you. I hope you enjoyed the green onions recipes I posted during the past two weeks and are ready for the next batch of recipes. As Easter is coming soon, I decided to cook and post for you some authentic Romanian Easter recipes next. And by authentic I mean the way my grandma used to cook them or the way my aunt still cooks them today. Really typical dishes that you will get to eat in every Romanian family this time of the year (and some of them at Christmas too), those kind of recipes for which each woman has a slightly different recipe. Every member of their family is probably convinced that their wife/mother/grandmother has the absolute best recipe out there, just like I am quite sure that my grandma cooked these dishes better than anyone else. Am I making any sense? Do you know what I mean? 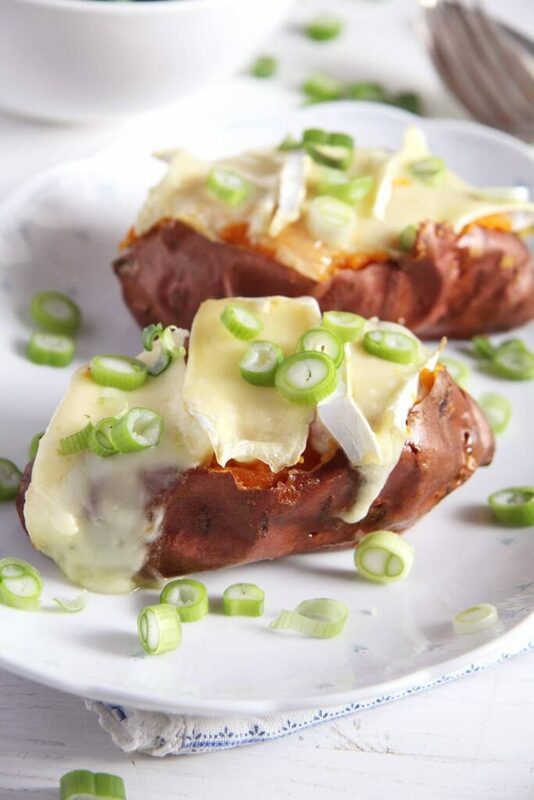 But until Wednesday, here are the sweet baked potatoes with green onions and cheese. Preheat the oven to 200 degrees Celsius/ 390 degrees Fahrenheit. Wash and dry the sweet potatoes and prick them all over with a fork. Rub them with the oil, sprinkle with some salt and pepper, place on a baking tray and bake them for about 40-45 minutes or until cooked through. It might take a shorter or longer time to have them ready, it really depends on their size. In the meantime, slice the cheese and chop the green onions thinly. You can make a salad as well, if you wish. When ready, take the sweet potatoes out of the oven and split them lengthwise in the middle. Carefully scoop out some of the flesh, as much of it as you can without hurting the exterior of the potatoes, mix this with the butter and half of the green onions and stuff it back in the potatoes. Arrange the cheese slices on top, sprinkle with some more freshly ground black pepper and bake for another 5 minutes or until the Camembert starts to melt. Scatter the remaining green onions on top and serve with the salad. Good luck, Priya! Sweet potatoes are amazing in any form, I hope you give them a try. 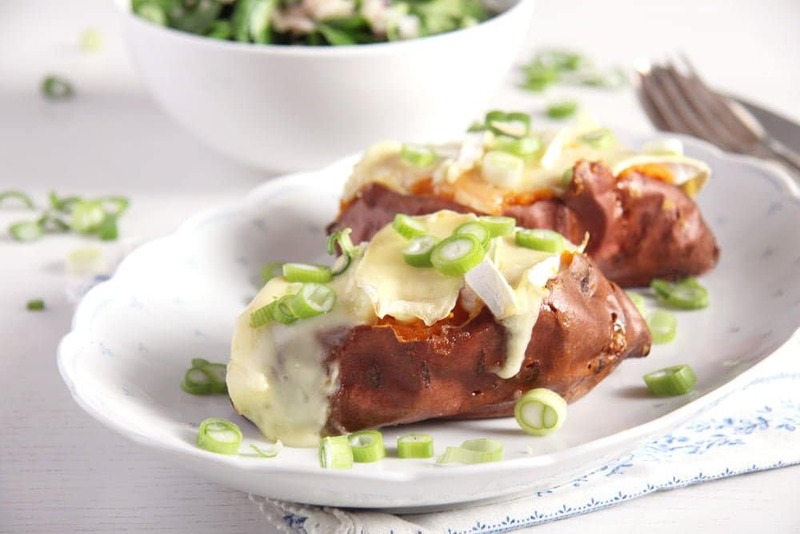 Stuffed baked sweet potatoes are my favourite things! They are sooooo good! Hmm, the sweet potatoes look delicious. I like them too, although my husband is not that keen on them. I think the main idea for these recipes is the same, but every woman has its own interpretation of them! I hope you like the way my grandma cooked these recipes. I didn’t know sweet potatoes could look so delicious! What a wonderful way to dress them up! OMG, they look amazing, Loving the sound of these. Love the marriage of sweet potato and green onions. Thank you for the recipe, can’t wait to try. I hope you like them, Anu! 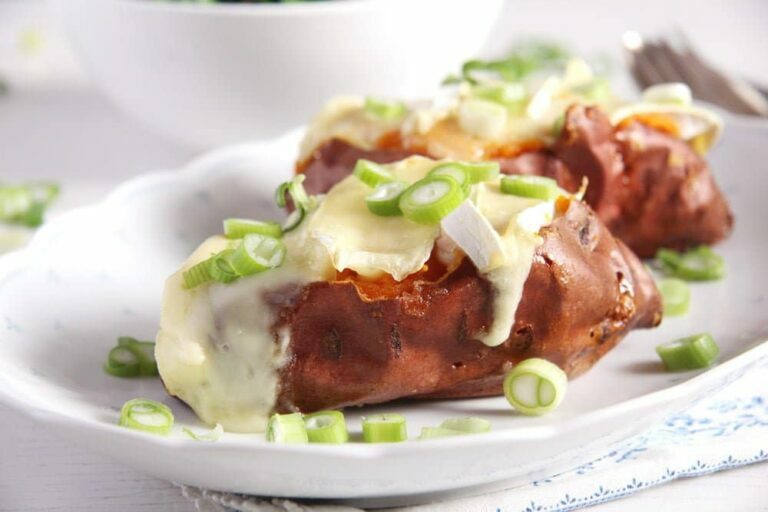 These sweet potatoes look absolutely delicious! Is it dinner yet?? Don’t give up on those kiddos – they are bound to like sweet potatoes eventually! My 4 1/2 year old is just now coming around to them. (She liked them as a baby then didn’t touch them much for a few years.) My 2 1/2 year old has been a huge fan since birth. He will eat as many roasted sweet potatoes as I can give him. And I am a HUGE fan of any potato, any which way. 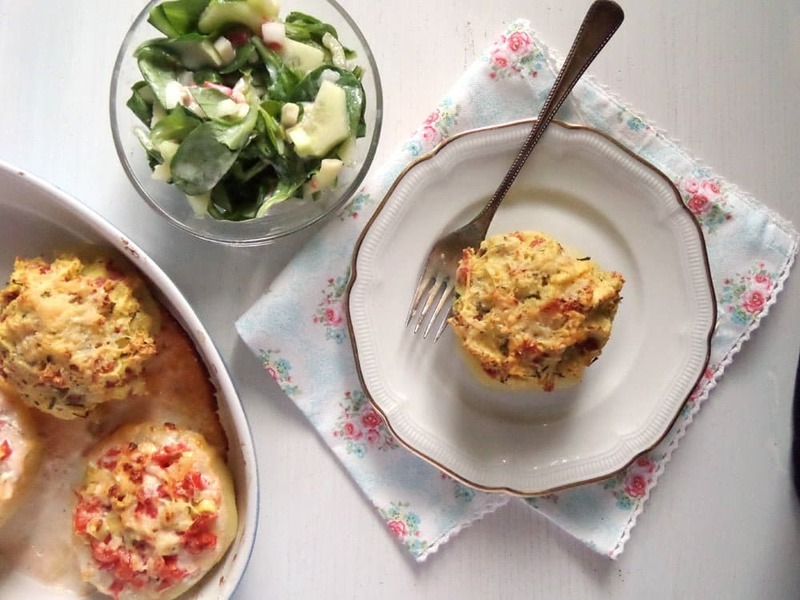 Know I will love this version – what a great combination of flavors! oooh, your cheese selection is PERFECT! 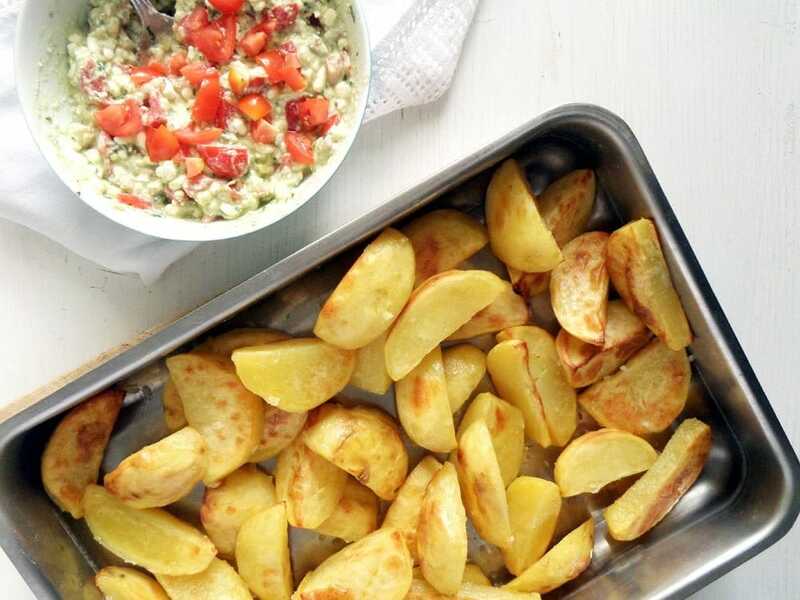 i love sweet potatoes and am very drawn to this preparation–beautiful, delicious creation, adina! I bake sweet potatoes all the time but never had it with cheese! It looks very mouthwateringly good! I really miss meat at all when I eat satisfying dishes like this. Thank you, Erin. 🙂 I love that towel too.